Avoiding the chances of developing gum disease can be achieved with routine dental check-ups. Our bodies, including our mouths, are naturally full of bacteria. These bacteria constantly form a sticky ‘plaque’ on teeth that causes the enamel to decay. Without daily brushing and flossing, plaque can harden and form tartar that brushing alone cannot remove. 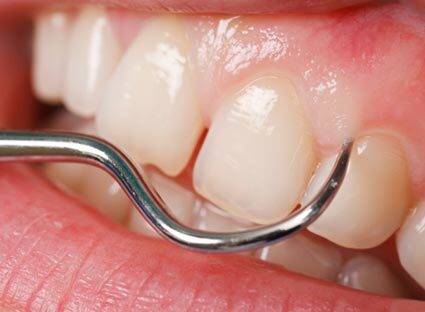 Professional cleaning by a dentist or dental hygienist is the only way to remove tartar. The longer plaque and tartar remain on teeth, the more harmful they are, eventually leading to inflammation of the gums known as gingivitis, where the gums become red, swollen and can bleed. Gingivitis is a mild form of gum disease that can usually be reversed with daily brushing and flossing, and regular cleaning by a dentist or dental hygienist. However, if gingivitis is left untreated it can lead to periodontitis, which literally means ‘inflammation around the tooth’. With periodontitis, gums pull away from the teeth and form spaces called pockets that become infected. The body’s immune system fights the plaque as it spreads and grows below the gum line. Bacterial toxins and the body’s natural immune response begins to break down the bone and connective tissue that support the teeth. If not treated, all of these structures can be destroyed. The teeth may eventually become loose and have to be removed. Also, some studies have found that people with gum disease were more likely to develop heart disease or have difficulty controlling blood sugar. Your treatment will depend on the severity of your gum disease. If you have gingivitis, your dentist or hygienist will clean your teeth thoroughly with abrasive toothpaste, an electric toothbrush and a special instrument called a scaler. If gingivitis has developed into periodontitis you may need more extensive scaling to remove plaque and tartar from the periodontal pockets. This can require several appointments. Your dentist or hygienist will monitor the size of the periodontal pockets during the following months to make sure the treatment has been successful and the periodontitis isn’t getting any worse. Your dental hygienist can show you how to brush, and also how to use floss and inter-dental brushes to remove plaque and food debris from places toothbrushes can't reach. Maintaining these levels of excellent oral hygiene is the most important factor in preventing periodontal disease. Concerned about your oral health? Why not give us a call on 01925 768 111 and book your appointment today!